As a homeowner, you’re always trying to add value to your home. One way to do so that is commonly overlooked is by adding an awning to your home. An awning brings a great deal more to the table than additional value, however. For starters, it essentially creates a new outdoor living space for you and your family. When you install an awning, you add an area to your yard for you to sit down and read, have a meal, or just sit outside and enjoy the weather even if there are passing showers. This space can also be used for get-togethers and summer parties, offering a convenient place for you and your guests to sit together and enjoy the outdoor season. An awning also gives you another shaded space in your yard. Sometimes the summer heat can be unforgiving. With an awning set up, you can still spend time outside while catching a break from the sun’s heat. This is also helpful if you and your family want to sit outside to eat on a hot summer day. The awning will keep you from sweating and getting sunburnt while you eat. Another great reason to add an awning is that it adds curb appeal to your home. If you were to add it to the front of your home, people driving or walking by would instantly notice the awning and the extra shaded outdoor space that it adds to your property. This added curb appeal can be a great benefit if you sell your home. Potential buyers will be drawn to your covered patio or deck, which will only prove to be an additional incentive for someone considering making an offer on your home. 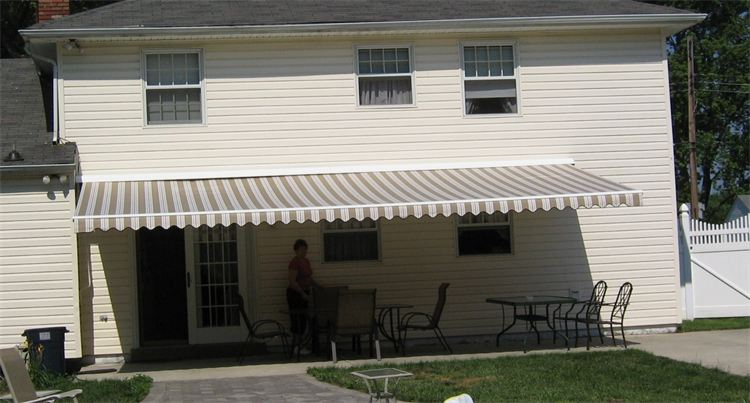 When you decide an awning would be a great addition to your home, contact the professionals at JM Finley LLC. We’ve been designing and installing both permanent awnings and retractable awnings for more than 35 years and will make sure you get the best awning for your home. For more information on our services, give us a call today at 610-505-5907.